Dental and oral health problems in Indonesia at present are a classic problem, characterized by high prevalence rates and dental caries and periodontal disease. From the data released by the Ministry of Health (MOH) of Indonesia in 2001, the prevalence of dental caries and mouth sufferers is 60% of Indonesian population. Ironically, 71.8% of the population does not treat or seek treatment when they have dental caries. That is, if we observe the shifting pattern of epidemiological dental disease, although supported by sophisticated treatment technology and integrated dental health service system, the dental and oral pain rates remain the same today. Nowadays, in public opinion, dental caries treatment is still a “second class” treatment or something that not life threatening that makes people reluctant to come to the Public Health Centre. They still think that dental treatment is less necessary. This is evidenced by data released by the National Health Survey in 2004 that only 38% of the population came to the health center and only 4.9% to government hospital. A research conducted by Anggita on the population of Maospati, Madiun, East Java, in 2003 showed surprising data. Of the 95 respondents studied, 54% had proper knowledge, 68% had perceptions about the impact of good dental caries, 90.5% had high motivation and a positive attitude toward dental and oral care, and 63.2% wanted their teeth to be maintained and treated rather than extracted. However, from these encouraging data, the number of dental health and mouth is quite apprehensive. Of 54% of respondents who had good knowledge about oral health, only 48.8% had good dental and oral health. In 68% of respondents who had a good perception of the effects of dental caries, only 48.3% had good Decayed, Missing, Filled, Teeth (DMF-T) and Simplified Oral Hygiene Index (OHI-S). Of the 90.5% who had a positive attitude toward good dental care, 48.8% had bad oral hygiene. Then, the researchers conducted preliminary research on twenty respondents in Surabaya. Of the total twenty respondents, 75% had good dental health knowledge, but 60% had low dental and oral health. Nearly 75% had perceptions about the impact of good dental caries, but only 33.3% had good dental and oral health. The data on tooth-generating motivation obtained were quite high (50%), but 63.7% did not have good dental and oral health, as well as positive attitude toward dental and oral care (80%), only 44% had the good one. Furthermore, there were 50% respondents who wanted their teeth maintained and treated rather than extracted. From the aspect of organizing dental health services, one of the classic supporting factors of dental and oral health problems is dental and oral health technical services that are not optimal. To obtain good behavior, the process can start from the communication and information processed by the brain and becomes a new knowledge. Then, the new knowledge is perceived by the body or the five senses and underlies the emergence of a positive or negative attitude to the information and affect the need for new things. From the above data, although a person have good knowledge, perception, attitudes, and motivation, it will not make a person have the need to treat teeth and mouth to be higher automatically. Clinical indicators are very good for measuring dental and oral diseases including dental caries, but clinical indicators are not satisfactory to measure health and treatment needs. Therefore, to be able to measure the success of improving dental and oral health and measuring treatment need, it must involve the social functions and dimensions of dental and oral diseases including caries. From the above description, it can be observed that the role of communication is so vital. Therefore, the researcher wanted to observe the correlation of dental health communication with the picture of felt need of dental caries care in every social class of society in quality of life and personal comfort so that dental health services given to the society become effective and efficient. Tambaksari subdistrict was chosen as a research site because the population had high heterogeneity in terms of economy, education, tribe, religion, and different groups. Hence, with this background, the differentiation about the perceptions, attitudes, and actions in various dental health will be obtained. This was an observational analytic research with population sample study of Tambaksari subdistrict population, Surabaya, aged between 19 years and 56 years (productive age). Sample number in this study was taken using the formula, and a number of 95.96 was obtained which was rounded to 96 respondents. For sampling, stratified random sampling technique was used by stratifying the population into five social class groups, namely: social Class I or professional or skilled nonmanual 1, such as doctor, lecturer, pilot, accountant, pharmacist, and lawyer (3 respondents); social strata Class II or intermediate or skilled nonmanual 2, such as manager, nurse, and teacher (19 respondents); social strata Class III NM or skilled nonmanual 3, such as secretary and shop assistant (15 respondents); social strata Class III M or skilled manual, such as driver, hairdresser, and craftsman (20 respondents); social strata Class IV or partly skilled, such as farmers, conduits, and postman (2 respondents); and social strata Class V or unskilled, such as assistant household, laborers, and construction workers (37 respondents). In this study, six variables were the knowledge of dental caries, perception of dental caries impact on oral function (including social function and life in general), motivation of dental caries treatment, attitude toward dental care, community perceived needs felt need, and dental and oral health communication. The research instrument used questionnaires, including the use of Oral Health Impact Profile (OHIP) index and intra-oral examination and OHI-S and DMF-T examination for primary data. Whereas for secondary data collection, it was done by recording the data contained in the institution related to the research, for example government agency (District and Bakesbang Linmas) to obtain the number of permanent residents, the seasonal population, the type of occupation, and so on. After collecting data, data processing was done by inferential analysis using crosstab or cross test between social strata of the population with six variables of research using Spearman correlation test statistic. Data collection was conducted on 96 respondents according to the size and criteria of the sample that had been determined. Respondents were residents in Tambaksari sub-district, Surabaya, which were grouped into five groups according to the society's strata and cross-tabulated on six research variables. Ethical approval for doing this study has been obtained from the Research Ethics Committee of Faculty of Dentistry Universitas Airlangga (No. 195/KKEPK.FKG/XII/2012). The informed consent was signed by the respondents. Cross-tabulation between the level of knowledge about dental caries as measured from the answers to the caries knowledge questionnaire with the social class strata is summarized in [Table 1]. From the table, knowledge of dental caries with the highest score was in skilled nonmanual 1 class of 100% and the lowest was in the social class unskilled as much as 54.1%. With Spearman's correlation test, the value of P = 0.001 (P < 0.05) was obtained, meaning that there was a significant correlation between social class with knowledge level of dental caries in every social class of Tambaksari resident of Surabaya City. Spearman's correlation coefficient of r = +0.704 (r > 0.5) was obtained. On cross-tabulation between perceptions of the impact of dental caries on oral cavity function, social function, and general life with social class strata, the results showed that skilled nonmanual social Class 1 mostly experienced physical pain perception, psychosocial discomfort, physical inability, and handicap [Table 2]. While in skilled nonmanual social Class 2, the most recommended were the perception of social incapacity, as well as skilled manual social Class 3 was superior in social disability. In partly skilled classes, almost all perceptions were ranked at most except in handicap perception or inability to work. In the last social class, unskilled social class, perceptions about the impact of dental caries were mostly on the perception of physical pain, whereas perception of work disability was ranked at least. On cross-tabulation between motivation to dental caries treatment with social class strata, it was found that the highest motivation in social skilled Class 1 skilled nonmanual 1 was 66.7% and low motivation was mostly in the social class of Unskilled as much as 29.7% [Table 3]. With Spearman's correlation test, the value of P = 0.001 (P < 0.05) was obtained, indicating that there was a significant correlation between dental caries motivation with each social class of Tambaksari population of Surabaya City, whereas Spearman's correlation coefficient showed r = +0.400. This means that the relationship between motivation and social class was not so strong but unidirectional. Hence, the higher the social class, the higher the motivation for dental caries care and vice versa. On cross-tabulation between attitude of dental caries service and social class stratum, it was found that the most positive attitude in skilled nonmanual 1 skilled social class population was 100% and the most negative attitude was 35.1% for unskilled social class [Table 4]. With Spearman's correlation test, the value of P = 0.381 (P > 0.05) was obtained, indicating that there was no significant correlation between attitude of dental caries care service with every social class of Tambaksari residents of Surabaya city. For cross-tabulation between felt need of dental caries treatment and social class strata [Table 5], it was found that the required felt good dental caries treatment was in the social skilled class population of skilled nonmanual 1 of 66.7% and the felt need for the lowest dental caries treatment was in the unskilled social class of 37.8%. With Spearman's correlation test, the value of P = 0.002 (P < 0.05) was obtained, indicating that there was a significant correlation between felt need of dental caries treatment with every social class of Tambaksari residents of Surabaya City. For cross-tabulation between dental health communication and social class strata [Table 6], it was found that good dental health communication was highest among skilled nonmanual 1% social class population and low dental communication with lowest dental caries treatment in the class population social unskilled of 51.4%. With Spearman's correlation test, the value of P = 0.001 (P < 0.05) was obtained, indicating that there was a significant correlation between dental health communication with every social class of Tambaksari residents of Surabaya City. Spearman's correlation coefficient showed r = +0.448 (r< 0.5), indicating the relation between social class with dental communication was weak and in one direction indicated by positive sign. Thus, the higher the social class, the higher the dental health communication used and vice versa. The result of Spearman's correlation statistic test showed P = 0.001 (P < 0.05) on the relationship between dental health communication with felt need for dental caries treatment. In this study, it is known that skilled nonmanual 1st class social strata group had the highest number of cross-tabulation with each research variable. In contrast, the unskilled social class strata group had the lowest number of cross-tabulations with each of the research variables. In principle, perception is an experience produced through the senses of sight, hearing, smell, and so on. Differences in perceptions of the impact of dental caries as measured by OHIP may be due to the characteristics of DMF measured through clinical indicators, as reported that there is a correlation between clinical indicators and OHIP. In the variable of knowledge level of dental caries, with Spearman's correlation test, the value of P = 0.001 (P < 0.05) was obtained, meaning that there was a significant correlation between social class with knowledge level of dental caries in every social class of Tambaksari Subdistrict of Surabaya City, with Spearman's correlation coefficient of r = +0.704 (r > 0.5). This means that the relationship between knowledge and social class is strong and the positive signs indicate a direction which means, the higher the social class level, the higher the knowledge of dental caries care and vice versa. This is possible because the social class is related to life chances. The opportunity to live is a chance to get the best out of living conditions, including the opportunity to get an education. The higher or longer a person is educated, the more knowledgeable his/her experience and knowledge will be, thus raising the assumption that someone with a higher education will respond better than someone with a low education. Spearman's correlation test on attitude variable of dental caries service was obtained of P > 0.05, which means that there was no significant relation between two variables with social class strata. 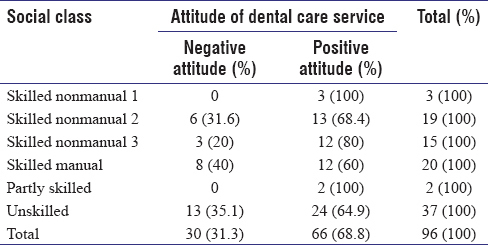 Based on the data obtained, almost all social classes had positive attitude toward dental caries care. From the results obtained also, the attitude is not influenced by social class. This means different social classes do not rule out the same attitude toward dental caries care. Attitudes are influenced by various factors such as knowledge, motivation, perception, and groups. For correlation between dental health communication with felt need of dental caries treatment, Spearman's correlation test was obtained of P = 0.001 (P < 0.05), which means that there was a significant correlation between the two. Then, Spearman's correlation coefficient of r = +0.496 (r< 0,5) was obtained, which means that the relation between dental health communication with felt need care of dental caries was weak and the positive sign indicates unidirectional way which means that the better the communication of tooth health, the better also the felt care need caries treatment. In a communication, messages with the same content can be interpreted differently can be conveyed in different ways and channels. If a dental health message is delivered by a dentist or health worker, the community will react better than the message received by relatives or friends. Messages delivered by someone who is competent in their field will also impact on motivation, attitude toward care, and perception. Similarly, with the need for dental caries, the need for caries treatment will increase when messages about dental health are delivered with good media, such as television, by competent people in the field. Thus, by using appropriate and effective dental communications, it is likely to be followed by increased felt need of high dental caries treatments as well. There was a significant correlation between dental health communication with a profile of felt need of dental caries treatment of Tambaksari Sub-district residents, Surabaya City. Well-created communication will give good felt need as well. Indonesian Statistical Centre. National Health Statistics. Jakarta: Indonesian Statistical Centre; 1998. p. 70-91. Bierhals CC, Santos NO, Fengler FL, Raubustt KD, Forbes DA, Paskulin LM, et al. Needs of family caregivers in home care for older adults. Rev Lat Am Enfermagem 2017;25:e2870. Memarpour M, Bazrafkan L, Zarei Z. Assessment of dental students' communication skills with patients. J Adv Med Educ Prof 2016;4:33-8. Hariyanto H, Widyanti N, Priyono B. Relationship between knowledge, perceptions, and attitudes towards dental health with dental health status in blind students at the Bian Netra social institution (PSBN) Wiyata Bina Bandung; 2005. Walker KK, Jackson RD, Maxwell L. The importance of developing communication skills: Perceptions of dental hygiene students. J Dent Hyg 2016;90:306-12. Tabassum N, Ahmed S, Alshamman Y, Barn G, Alnafea M, Alatiyyah MS, et al. Patient's attitude towards dental treatment: Treatment plan versus patient willingness. Int J Dent Res 2017;2:73-5. Darmawan S, Woerjani MS, Sampoerno G. Socio-Dental Role Indicator in Determining Dental and Oral Health Services. Dent J 2001;34:151-6. Awan KH, Khan S, Abadeen Z, Khalid T. Knowledge, perceptions, and attitudes of dental students towards obesity. Saudi Dent J 2016;28:44-8. Poudel P, Griffiths R, Wong VW, Arora A, Flack JR, Khoo CL, et al. Oral health knowledge, attitudes and care practices of people with diabetes: A systematic review. BMC Public Health 2018;18:577. Wahengbam PP, Kshetrimayum N, Wahengbam BS, Nandkeoliar T, Lyngdoh D. Assessment of oral health knowledge, attitude and self-care practice among adolescents – A state wide cross – Sectional study in Manipur, North Eastern India. J Clin Diagn Res 2016;10:ZC65-70. Barrett B, Shadick K, Schilling R, Spencer L, del Rosario S, Moua K, et al. Hmong/medicine interactions: Improving cross-cultural health care. Fam Med 1998;30:179-84. Mulyana D. An Introduction to Communication Studies. Bandung: PT. Remaja Rosdakarya; 2002. Notoatmojo S. Health Research Method. Jakarta: PT. Rineka Cipta; 2002.